Students walked among the undead when the zombie apocalypse came to OCCC Thursday afternoon, Oct. 25. Costumed students in the Stage Makeup class used the first half of their class time to apply their gruesome zombie wounds. Once zombiefied, they began their walk of terror throughout the campus for the remainder of the period said adjunct Professor Suzette Sroufe. The first stop for this group of moaning undead was the Pioneer office right across from the stage makeup classroom, room 1F5-AH or the Green Room. From there, the zombies spread out to other areas including other offices, the cafeteria, and outside the college, Sroufe said. Sroufe teaches a class on stage makeup on Thursdays from 1:30 to 4 p.m. in the fall. In her regular job, she is employed by Oklahoma City Repertory Theatre, or City Rep, as the hair, makeup, and prop designer. 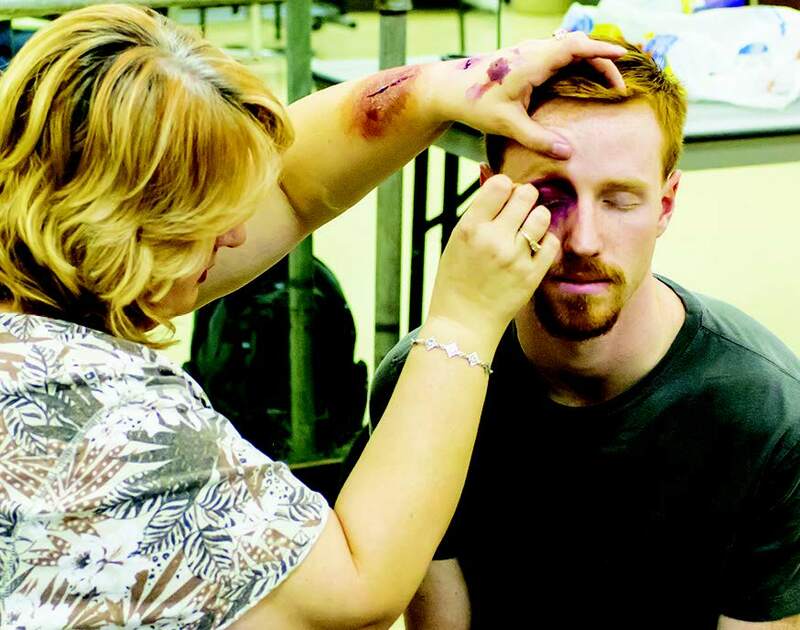 Stroufe had already taught the students how to use makeup to simulate bruises, broken bones and gashes. During class Oct. 11, the lecture topic was the different causes of trauma. “There is natural trauma and unnatural trauma,” Sroufe said. These two make a difference on how the wounds should appear. Natural trauma like viruses or disease would be completely different from unnatural trauma like a car wreck or a bullet wound. The cause of the trauma determines how you will construct the wound. Sroufe asked students to consider what is underneath the skin. What would be showing from a wound depends on what type of trauma and the cause of the wound, she said. Bone, muscle, fat, and blood are some of the elements that make stage makeup look believable . “When creating a wound, you have to know what you are damaging, you have to know what is underneath,” Sroufe said. Sroufe demonstrated how to make a cut on her arm. First she folded a tissue and tore off a small piece. Then she applied latex to the desired area of her arm for the wound. Latex is a flesh colored quick-drying substance used to create the appearance of skin and can also be used to apply theatrical prosthetics. Next she unfolded the tissue and placed it on the latex, recoating the tissue with latex, especially around the edges. She then used blood-red color to paint the split or cut along the ridge caused by the tissue fold. She painted a color similar to her skin tone around the outer wound then blended in purple and dark red for bruising or scabbing. The tool used for applying the makeup is a sponge. When making a stage wound, the appliance, in this case the tissue, simulates the swelling and displacement of the cartilage. Different colors of makeup are used for the bruising and bleeding. After demonstrating how to make a black eye and a broken nose on two of the students, Sroufe sent them to make their own cuts, split lips, and black eyes. The classroom walls are lined with lighted mirrors, tables, and chairs for the students to create their own makeup magic. Their skill was on display when the walking dead come to life Oct. 25. Students lucky enough to be on campus enjoyed their chance to survive the zombie apocalypse.